Halibut is one of my favorite fish to cook. I love the texture and the mild flavor, and it’s an easy fish to find. Best of all, Halibut in pretty “forgiving” when it comes to cooking. Don’t get me wrong, you need to be careful not to over or under cook it, but I think you’ve got a bit more room to play with than some other fish. 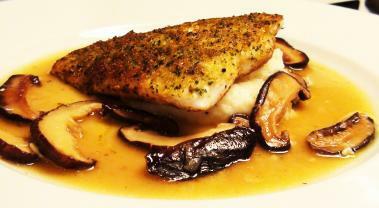 In this recipe video, I cook an herb crusted halibut filet, served with a shitake mushroom broth, over mashed potatoes. The crispy herb crust gives the dish a nice texture, the mushrooms an earthiness, and the creamy mashed potatoes hold everything together. Most importantly, don’t overcook the halibut. While it is a forgiving fish, you still need to be careful. Watch for the doneness clues, primarily the color around the edges – which I describe below and show in the video. The mushroom broth has very few ingredients, and is subtle. To extract the most flavor I use more mushrooms than I’ll actually want to eat, and cook them thoroughly to extract their flavor; and use a good chicken stock as it carries the broth. Once cooked, add in the shallot and garlic, and turn the heat all the way down. Let them sauté until soft – just a few minutes. Lay the halibut filets in the pan, crust side down, and then don’t touch, move or flip them for at least a minute. You want to cook that crust onto the fish. In this recipe video, I serve the halibut over some mashed potato, which is great. But it would just as easily go great with rice, pasta, polenta or any other starch. Place the filet on top of the potato, and spoon the mushroom broth around it, making sure to scatter some of the mushrooms about. This is a great, tasty and healthy dish, hope you enjoy it!! Made this recipe last night. My family and I LOVED this!!! Can't wait to make it again! This was SO delicious! I highly recommend this recipe!